How To Start Exercising -The fit sisters. I've been into exercising as long as I can remember. There were times I didn't do anything though; when I was in love, after I had my son, when I was stressed at work. But I was always conscious of missing it out. And I always knew, the minute I'd open my eyes, that my body and mind needed it. Every time I'd go back to it, I'd stick with it a bit longer. Until it became a fact of life for me: I can't live without exercise, I'm not a good person if I don't break a sweat. It wasn't easy, and still isn't some days, but now I know how to make it work. I know what it takes to get back on track. All you have to do is START. 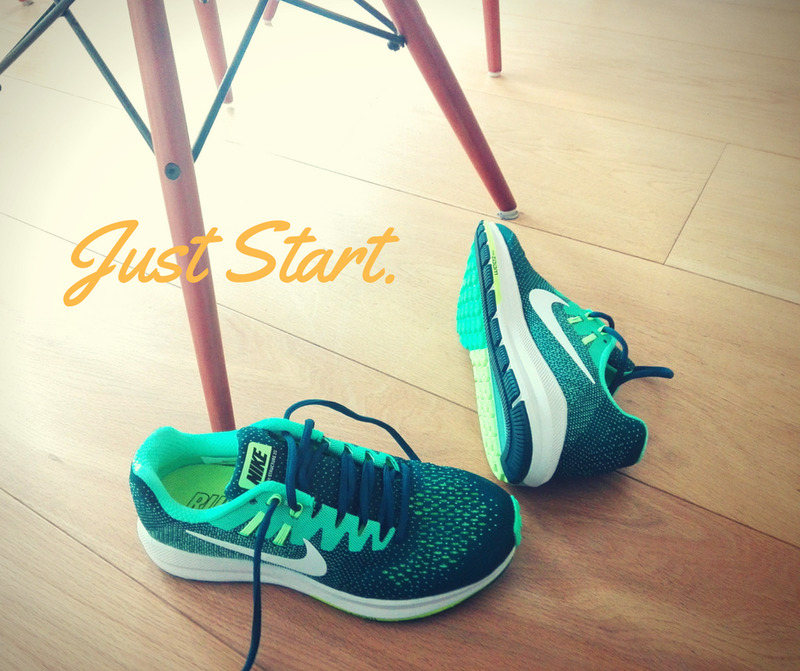 JUST START. 1. Set a challenging goal, and go full steam ahead for it. If you like a challenge for the sake of it, and if you are a chaser, or the enthusiastic type, the 1st option is the best. Just start. The challenge here is to maintain your enthusiasm in tough times lol. That's when you'll see no progress. There'll be times you'll feel the exercise doesn't worth the sweat. Many times. Then you need to find out, what can keep you going. - Is it change? Go to a new class, practice a new pose. I have a friend who spent more than six months getting a yoga pose right (her way right, there's no right way). She practiced only that. Great exercise, and a great way not to give up. Perfecting what you like. - Are you competitive (with yourself)? change often your exercise application. Set new goals, add some variation. Go exercise with someone you admire. Register for a bootcamp, or a challenging run race. Marathon, anyone? - Do you need praise to maintain your enthusiasm? Get a trainer, join an accountability group, take selfies. So if you get easily enthusiastic but lose it all just as easy, start again. And again. And again. At some point you'll know what's coming. Changing is a great thing. Be conscious, don't let this stop you. You can drop out, and go back to it again. Just start. Think every time is your first time. You can jump in again, and again. You've done it before, you'll do it again. 2. Set a less challenging goal, and work slowly to get there. If you are afraid of failing, or if the thought of start running, or following a gym class, is overwhelming...start slowly. Walk your way to exercising. Just start. - You don't know where and how to start? Go walking. Get up and go for a fast-paced walk. 30'. Is it too much? Start with 15'. Anything to make you start. In this case you need something to jumpstart your way of thinking. I think that people who have an issue with big challenges, and prefer small steps, they don't believe they are capable of making it. It's the contrary of the intuitive, enthusiastic type. They both resign. For different reasons. Or you can be both, depending on the day. Sometimes you need to take it slow. There's no right or wrong, just different approaches in the way our minds work. - Are you bored? Keep a simple journal with what you accomplished each time. This is so important if you never exercised before. Keep track of your work, and be proud of it. Even if it's just 10' walking. Also make sure you have a good plan in place, increasing your exercise weekly. It doesn't have to be much, but you need to make progress. And register it. - Do you feel annoyed by all the noise? Close your ears. Don't listen to all the success stories. You're writing you own. Who cares if someone can run longer distance than you? Or if someone says you should be running instead of walking? Whatever, just do your thing. What's important is you started. And you'll get where you need to get, on your own terms. And clearly all these points apply to anyone. It's just a reference. You can be the second type, and still get a trainer. I wanted to show you that there're ways. It's only that sometimes we think we know who we are. And we don't try. You don't exercise to lose weight. It can happen, but this shouldn't be your initial goal. If you do this in order to lose weight, you'll be soon disappointed. Exercise is half of the deal in this "feel-good" story. The other half is nutrition. Ha, you knew that's what I was about to write. If you eat (consistently) bad, you won't be able to exercise. You won't be able to maintain your energy levels. You'll get injuries. Eventually you'll give up. Listen to your body. I know it's a cliché but it's true. If you pay attention to how you feel each time you exercise, there's less possibility to give up. Because I'm 100% sure that everyone feels better. You just need to remember how you feel each time the endorphins kick in. Think of that the next time you need some motivation. It's better when you have a goal. It's always better. You need a goal. Just make sure it's not a short-term one. And if it is, renew it each time. That's theory of course. You'll trigger the practice. And while I was writing this piece, I remembered I have to write a story about the different types of people I meet in gym classes. It's something that always fascinated me. I also owe you my favourite #YouTube trainers. Let me know when you start.